Nitecore is a company that produces high end flashlights, usually using extremely bright LEDs and with innovative features. The HC50 is one of their newest, giving you an extremely bright main LED with dual red LEDs for low light navigation in order to preserve your night vision. The big difference with this light as opposed to their other lights is that the HC50 is one of Nitecore's first headlamps, designed to be worn on your head or your gear with some slight mods for hands free operation. I'll be going over this flashlight inside and out, so keep reading for more info! Nitecore recently announced this light, and as part of the announcement, they indicated that they were looking for some testers. Having previously tested their P25 Smilodon, and having been VERY impressed with it, I was eager to see how well their newest light would compare. The flashlight is currently available at a few different retailers including Amazon, priced around $59.95. You will still need to obtain your own batteries, either two CR123A units or a single 18650, which is the preferred battery for optimum output. If you plan on using rechargeable units, plan on getting a charger as well, as the HC50 does not have any options for onboard charging. The HC50 is a relatively compact flashlight that is specially designed around a headband mounting system. Featuring a CREE XML2 (T6) main LED, this light is capable of 565 lumens of output from an 18650 battery. It is very simple to use, only using a single dual stage button to control all of the various functions of the light, from turning it on and off, cycling through brightness settings, enabling the flash modes, or turning on the secondary red LEDs. It's quite user friendly and is able to be swapped to either side for left or right handed users. It has a sturdy build, with an aluminum “unibody” construction, integrated cooling fins, drop resistance of 1.5 meters and 2 meters submersible capability. All of this sturdiness is in spite of the fact that the flashlight is relatively lightweight, coming in under 5 oz without a battery installed. It's not a burden to strap this thing to your head. Like the P25, the HC50 came in a retail ready cardboard box with plenty of details about the light held within serving as box art. Inside, a plastic inner liner keeps everything safe and secure during shipping. It's a simple package, but it gets the job done. The flashlight comes installed in its headband system, and the package also includes a warranty card and a few spare O-rings. As mentioned before, the pack does not include any batteries, so you will need to provide your own. The basic manual sheet does a good job of explaining all of this flashlight's functions, but I'll try to explain them here in this review as well. The HC50 features a solid aluminum “unibody” design with a removable end cap for battery installation. 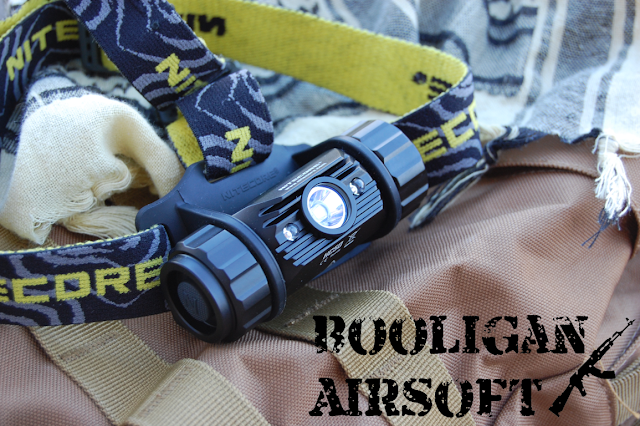 The LEDs are located on the side of the body which is quite a change from most flashlights which have the lens located at the front, but is necessary for the head mounted design. The end caps are different from each other, with one side being a solid piece and the other featuring the multi-purpose power button. I will be discussing all of the button's capabilities in the performance section of this review. The battery compartment is accessible by unscrewing the end cap with the button, and you'll notice that the battery compartment is not centered in the body of the light itself. It is offset to one side to allow the fitting of the HC50's electronics, and the cap has a small metal rod that fits into the body to keep it aligned when screwing it back on. You can use either two CR123 batteries or a single 18650 battery to power the HC50. The headband is easily adjustable for a wide range of head sizes, headwear, or helmet, however, if you do try to mount it on a helmet, you will likely need to incorporate some sort of attachment method to keep the straps from sliding off. The strap itself isn't a tactical design, given the light's general outdoor use design, and the bright yellow inner surface and Nitecore logos may give away your position if stealth is a concern. The plastic buckles and rubber housing are quite sturdy and easy to use even while wearing gloves. On paper, the HC50 is a very powerful, however compact head mounted LED flashlight. 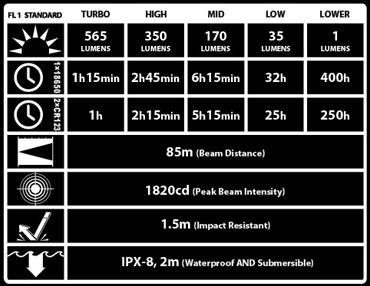 Nitecore provided this graphic to highlight some of the light's specs. In practice, I'm happy to report that the HC50 does not disappoint in the performance department. With a peak output of 565 lumens, and with a 100 degree wide flood pattern, the HC50 is designed for general outdoor use. You can easily cycle through the five different brightness levels using a half push on the single control button, from 1 lumen (400 hour runtime!) all the way up to 565 lumens, with an estimated runtime of 1 hour 15 minutes. The color and pattern of the HC50's main bulb is a clean, white circle of light with no major hotspots or other projector defects. Physically, the light does get quite warm after a few minutes of use, but the integrated heat sinks do a good job keeping it from getting too hot. Controlling the HC50 is a piece of cake, given that there is only one button to worry about. The button itself is a two stage unit allowing half and full presses, similar to the button on a camera. A full press will turn the flashlight on, and half presses will cycle through the five different brightness settings. If you hold it down fully for a second or so, it will turn on the red LEDs instead, with a half press then cycling between constant or blinking operation. Lastly, if you quickly give the button two full presses, it will turn on the main LED's blinking options, with a half press cycling between slow blink, beacon mode, and an SOS pattern. This button has one more trick up its sleeve, and that is to tell you the voltage of the battery that you insert. Upon inserting the battery, the button will blink to tell you the voltage, letting you know if you need to charge it up or not. Battery runtime has been on par with Nitecore's information, however, it will get quite warm if you keep it at the higher settings for longer than an hour or so. Great power output – 565 lumens max! I was very impressed with the P25 that I previously reviewed, and I'm happy to report that the HC50 is quite impressive as well. Offering high light output with a compact package, it's set up for convenient hands free operation thanks to its adjustable head strap system. You can also easily remove the light from the strap for use as a compact handheld unit or for tail-stand operation. The thing does exactly what it says it'll do on the label, and does a damn good job with it, and I'm happy to add it to my collection of very functional flashlights! Many thanks again to Nitecore, and of course, Airsoft Retreat!